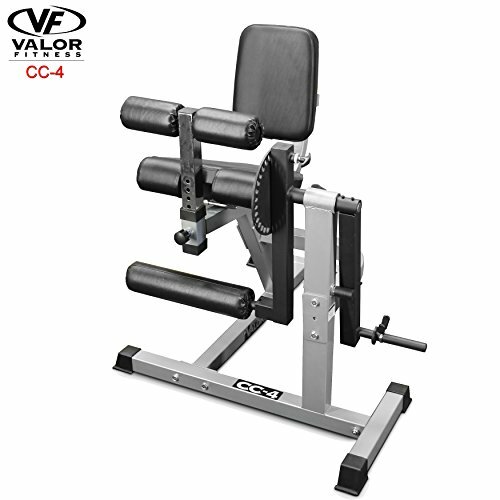 The Valor Fitness CC-4 Adjustable Leg Curl Machine allows the user to perform two key leg exercises, leg extensions and leg curls, while staying seated in the same location. Featuring an easy to use Sun Dial adjuster allows the user to increase the range of motion to accommodate, as well as determine, when resistance is applied. The back seat rest can be adjusted forward/backward depending on the height of the user. Once in place, the adjustable thigh support keeps your legs in place while performing leg curl exercises, ensuring that the hamstrings exert maximum performance. While loading weight onto the plate pegs, either 1 inch standard plates or 2 inch Olympic plates (with adapter installed) can be used with the Maximum Weight Load being 200 lbs.